I was at the Columbia Business School real estate career fair a few months back and the program director mentioned the CBS real estate club was larger than ever. Real estate has become a popular career choice amongst top MBA students as the market has performed well and the business has become more institutionalized. MBA programs can be a great way to transition into the real estate business, allowing smart young professionals to engage in the real estate business in an academic setting and in the real-world through a summer internship. 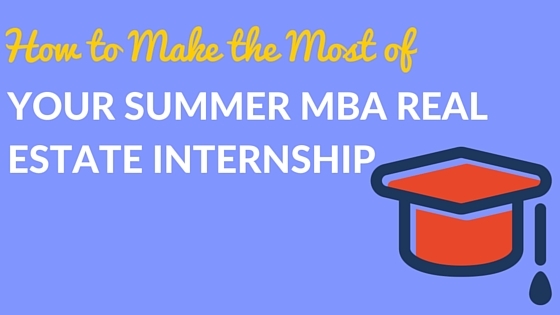 The summer internship is a critical time for an MBA. It provides an opportunity for MBA’s to try something new and determine if it’s the right career path for them following graduation. I asked Tom Lawless, a 2nd year at Wharton, to share his thoughts on the real estate business and how he made the most of his summer real estate internship. Prior to business school, Tom worked in finance and part of his motivation to go back to school was to transition into the real estate business. He spent the past summer interning with a top-tier real estate operator on the west coast. 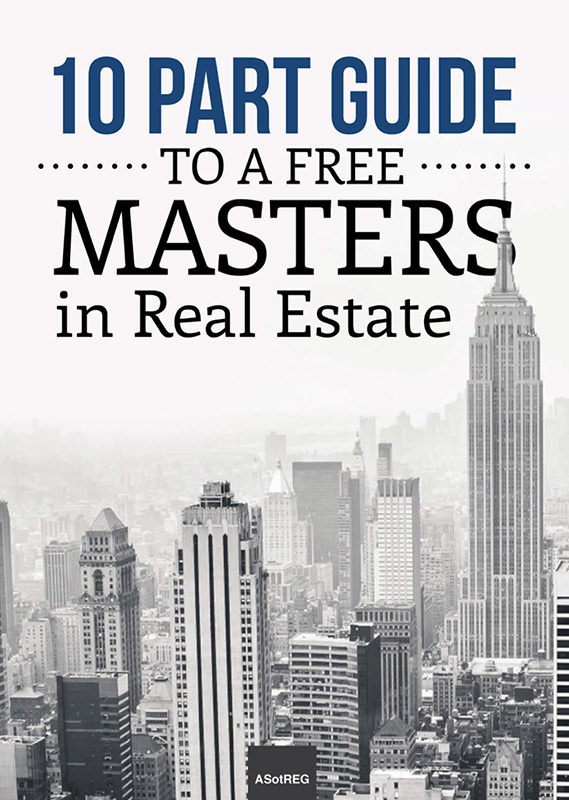 An MBA is not necessarily the traditional route into the real estate industry. Many of the most successful investment professionals and developers started right out of college. That said, it can be a great way to break into the industry if you are an outsider. The internship search can be overwhelming given the dizzying number of real estate firms. Some students may be more comfortable targeting the largest firms in a particular sector or city while others are more suited to a targeted approach. It is key to determine whether you want to be a capital allocator or a capital gatherer. The allocator model may appeal to those interested in complex financial modeling, deal structuring, or simply those with more of an interest in macro market plays. If you are more excited about day-to-day property operations, project management, and development then the operator route may be more your speed. Many firms offer a hybrid of these two, but typically firms specialize and you should determine what suits you best. I chose the operator path as I thought it provided the best opportunity to learn about multiple facets of the industry beyond just your typical MBA underwriting role. I was exposed to leasing, ground-up development, value-add acquisitions, market research, and more. My advice is by no means meant to be dogma for every individual. I have only been in the industry for one year so take my thoughts with that in mind, but hopefully, you can garner a few useful nuggets as you craft an internship or job search. Arrival: Show up early, but also at a time that is best for you. First in last out is a common refrain, but play to the culture of your particular firm. There may be people who work different hours (arrive early and leave on the early side). Do not feel like you need to arrive before everyone in the office, but make sure to beat your boss to the office more often than not. As long as you put in a hard days work and show your company that you care, do not fret too much about timing optics (subject to your firm’s particular culture). You only have ten weeks and you should be excited to be in the office every day otherwise you shouldn’t be there. Morning: Get caught up on recent market news. What deals were closed or announced and how do they relate to projects that your company is working on? What companies in the region are making major moves or investments? Potentially attend a team meeting to discuss the deals that are being tracked and next steps. Provide updates on your existing projects and ask for more. Noon: Potentially drive out to visit an existing property to manage a leasing process or evaluate a new acquisition with a quick drive by assessment. Take a lunch meeting with a broker or other firm that is active in the market to keep learning and expanding your network. Or, just ask one of your coworkers out to lunch to pick their brain about the company. Evening: Slog through as many projects as you can. Call competitive properties to collect rent comp information. Review some broker market reports and provide quick bullet point summaries to your team. Evaluate/build a pro formas and make suggestions to improve accuracy or conduct sensitivity analysis. Exit: If you have nothing else that you can accomplish in the office, head out for the day. If you are the only person there late at night and they know you have nothing to work on it might send the wrong message (you have no life or can’t manage your time). Check your email periodically in case your boss needs you to take a look at anything or makes plans for a morning property tour. Even if you are juggling multiple projects, never say no and deliver your finished work product as soon as it is complete. When things are really quiet or if you have some time after leaving the office, drive/walk around the market. Evaluate your firm’s current portfolio so you can be more helpful and informed in meetings. Tour the competitive set and analyze how other firms are positioning their assets in the market. Walk around properties that are on the market or under construction and bring them up with coworkers to hear their opinions. Success in real estate depends on connections so your firm should be supportive of taking some time to meet with other players in the market as long as it does not detract from your work. Some of my most interesting conversations were with development or property managers, and financial controllers. They know the nuts and bolts of the business and are valuable allies if you ever have a question that you may be too timid to ask your boss for help on. The more you get to learn how your company operates and thinks, the more you should be expected to contribute. If you think that it is time to explore disposition of an asset, put together a quick one pager and ask to walk through it with your manager. What deals has the firm looked at in the past? What is the performance of their existing asset portfolio? Do they have any strategy documents that can provide useful background knowledge? How did you approach the internship search? Do you have any networking tips? Cold email people at your target companies. Try to see if they went to your school or grew up in the same area of the country. Any way to personalize the cold email can go a long way. Set up informal conversations rather than interviews. Interviews will come naturally as you network with many different companies and approach the summer. Any Interview tips or resources that were helpful? What was your goal going into the internship? My goal was to learn as much about the industry as fast as possible, particularly with regards to acquisitions and development, but also leasing, property management, etc. Why did you choose to work for an owner/operator? I chose to work for an owner/operator because I wanted to be as close to the asset as possible while still being on the buy side. My internship experience was diverse and rich because I was able to see leasing, tenant management, acquisitions, and development all in one summer. I want to thank Tom for sharing his insights and advice. Real estate is an operational business that values experience. When exploring summer internships, don’t waste too much time fretting about the reputation of the firm or the pay, focus on the experience and the people you’ll be working with and start your journey as a student of the real estate game.